There's now even more time to get your nominations in for this year's awards. 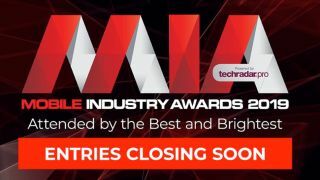 Due to popular demand we've decided to give you one more week to complete your entries to the Mobile Industry Awards 2019, powered by TechRadar Pro. Entries on the 20 categories for this year's awards are now extended to close next Thursday, April 4th, at 5pm. Don't miss out on putting your company up for one of the highest accolades of excellence in the mobile industry. Now celebrating its 17th year, the Mobile Industry Awards 2019 looks to showcase the gold standard of excellence in the industry - from the boardroom to the grassroots, with this year's event promising to be the best yet at London's Royal Lancaster on 6th June. This year's categories cover all areas of the industry, across Distribution, B2B, Networks, Companies, People & Teams. Voting will also open soon for this year’s Mobile Power 50, which ranks and recognises the industry’s most influential individuals, and Shop Idol, our UK-wide search for the nation's best mobile store salesperson. Voting is also now open for the 2019 Mobile Power 50! The Power 50 is the definitive list of the most influential figures in the UK mobile industry during the past year. The list is compiled after in-depth interviews with key senior figures across the industry, from operators and retailers, to manufacturers and distributors - but your votes will help decide the final say. For all awards updates, visit the Mobile Industry Awards 2019 site - we look forward to seeing you on the June 6th 2019!